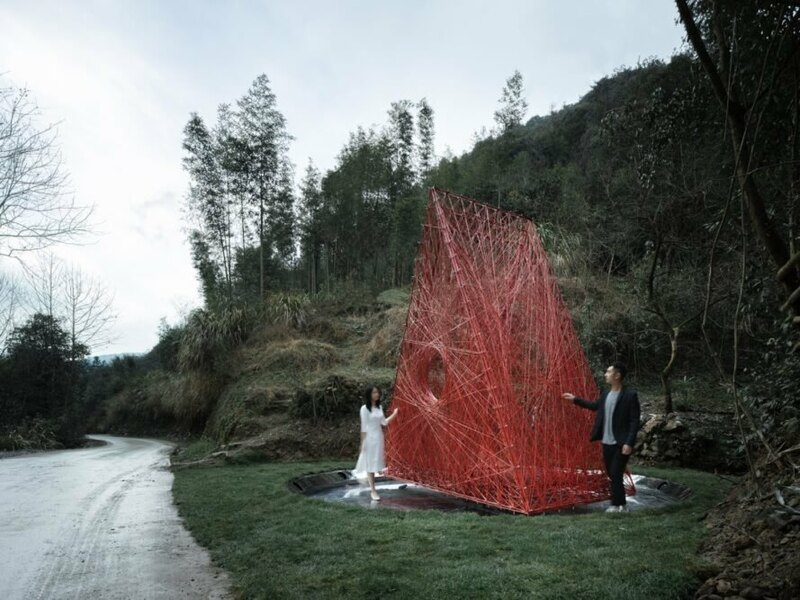 In the countryside of Zhejiang, China, Shanghai-based design studio Wutopia Lab has completed the Shrine of Whatslove, a robotically woven carbon-fiber structure devoted to love and marriage. 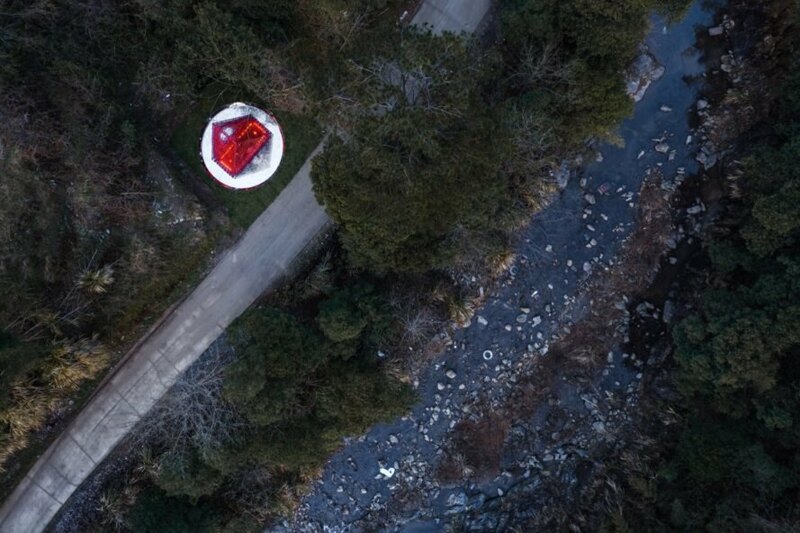 Created in collaboration with digital construction team RoboticPlus.AI, the Shrine of Whatslove takes the shape of a red, triangular pavilion evocative of a giant bird’s nest. Billed as “China’s first all carbon-fiber structure,” the installation is built from 7,200 meters of continuous carbon-fiber bundles and was completed in 90 hours. 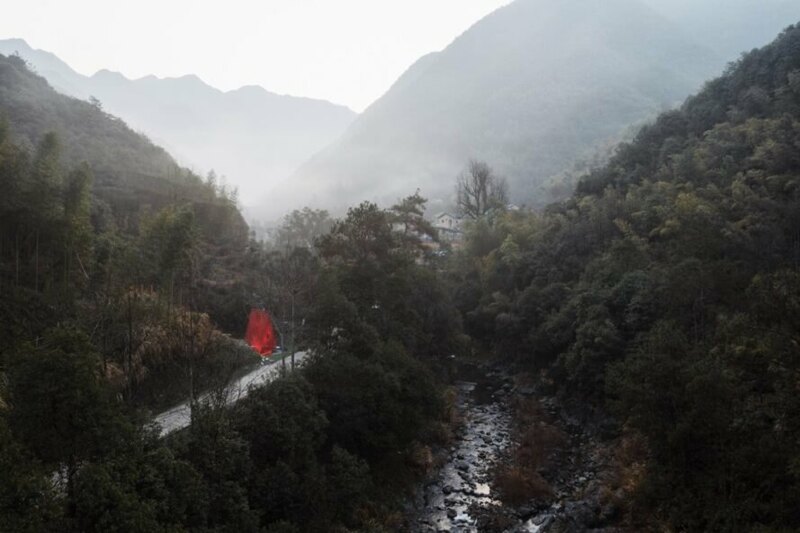 Located at the main entrance of the Fangyukong Guesthouse next to a stream, the Shrine of Whatslove stands at a little over 13 feet in height and is nearly 12.5 feet in width. Robots wove the structure from a continuous strand of carbon fiber. Elevated on footings, the pavilion appears to float above the landscape and is strong enough to support the weight of four people. 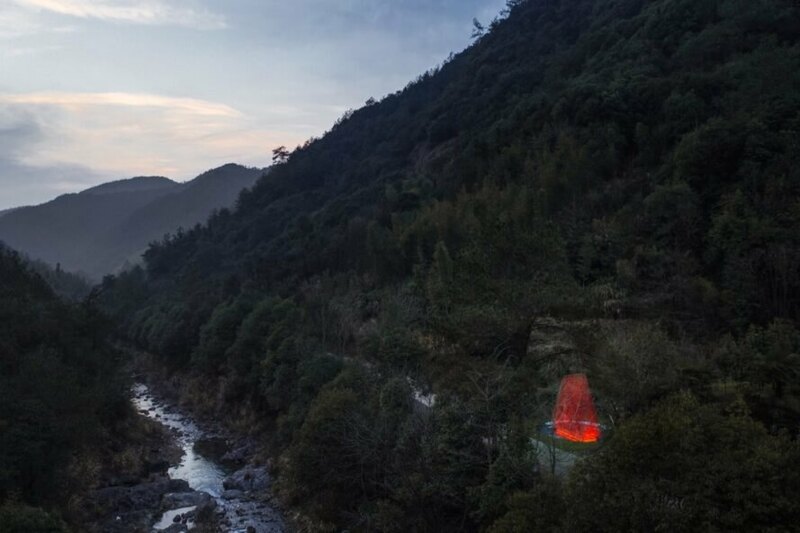 At night, the structure is illuminated from below, creating an ethereal glow in the landscape. 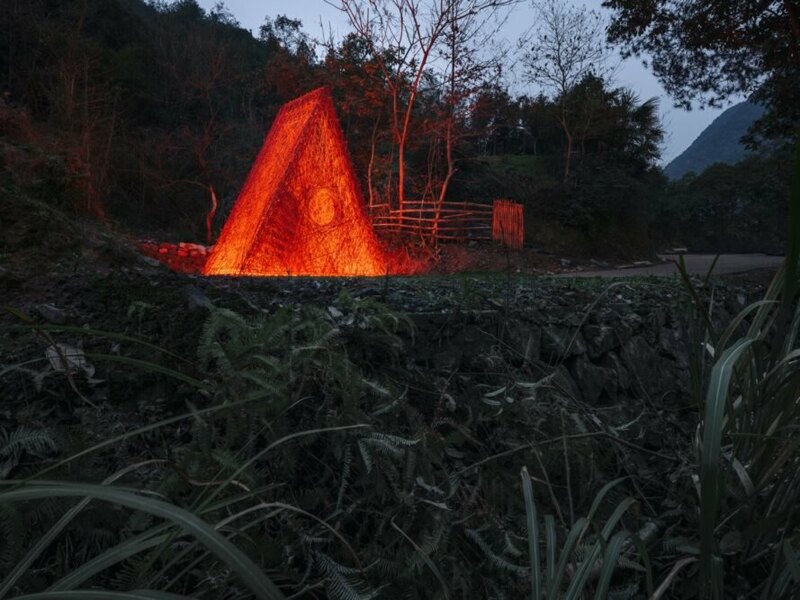 Wutopia Lab designed this bold pavilion for China's countryside. The pavilion is comprised of woven carbon fiber. The structure uses 7,200 meters of continuous carbon fiber. The design celebrates love and marriage. The carbon-fiber structure was constructed by robots. It took just 90 hours to complete the love shrine. 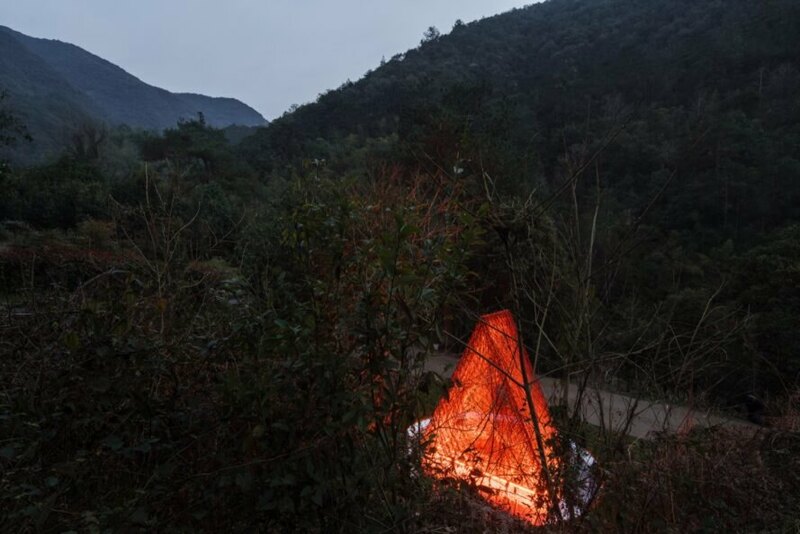 The pavilion stands out among its natural surroundings. It sits about 13 feet tall and 12.5 feet wide. The pavilion is illuminated from below at night. Robots wove the structure from one continuous strand of carbon fiber. The project was commissioned by the Fengyuzhu firm. The Shrine of Whatslove can hold up to four people at one time. The cabin is designed to inspire deep thought and discussion.